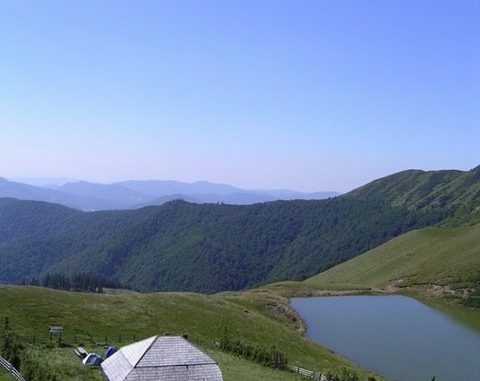 Lacul Vulturilor (Eagle´s lake), also called Bottomless Lake, is a periglacial lake located in the Buzău Mountains, at the Carpathian Mountains south-eastern curvature, at an altitude of 1420 m. The legend says that the eagles came to this place in spring to drink water, to become strong and, at the same time, they showed their chicks how to fly. In the surroundings of the Eagle´s lake you can find the only area where black goats can be find. They are protected by law being threated with extinction. The Eagle´s lake can be reached by foot or by 4 x 4 car. Caution: A hiking tour as well as a 4×4 tour is only recommended together with an experienced guide and during summer time. The way up to the lake from Valea Neagra takes 3-4 h one way. The alternative access starts at Chiojdu, distance around 15 km (5 hours hiking or 2 hours off road).